The Ion Age Blog: Taranis Repulsar Main Battle Tanks and Drones now released! 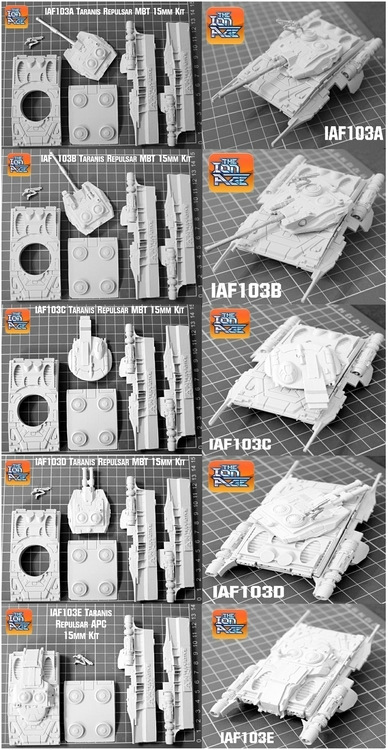 Taranis Repulsar Main Battle Tanks and Drones now released! 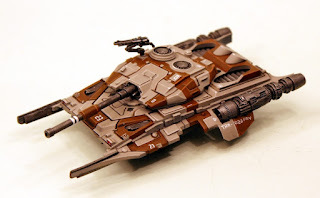 This is the core type of anti-gravity Taranis the main battle tank with projectile turret. It is composed of seven resin and white metal pieces which are the upper hull, the lower hull, right and left propulsion fins sections, projectile cannon turret as well as the main gun and the sponson gun in white metal. You can see them here with a scale of 1cm squares under laying the pieces. It is easy to assemble and we supply the kit with the finely detailed anti-gravity left and right fins on supporting resin blocks which can be removed with a hobby blade. 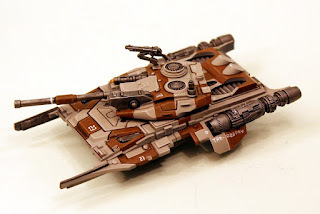 This vehicle is designed to be used for wargaming and thus it is durable. Assembled this vehicle is just over 110mm long and 55mm wide. We offer the choice of purchasing one kit or on the drop down menu the purchase of three with a saving of 10% on screen. Price 20.00GBP. Go HERE. This is the platoon command type of anti-gravity Taranis with projectile turret with additional rotary weapon and comms suite. It is composed of seven resin and white metal pieces which are the upper hull, the lower hull, right and left propulsion fins sections, projectile cannon turret as well as the main gun and the sponson gun in white metal. You can see them here with a scale of 1cm squares under laying the pieces. It is easy to assemble and we supply the kit with the finely detailed anti-gravity left and right fins on supporting resin blocks which can be removed with a hobby blade. This vehicle is designed to be used for wargaming and thus it is durable. Assembled this vehicle is just over 110mm long and 55mm wide. We offer the choice of purchasing one kit or on the drop down menu the purchase of three with a saving of 10% on screen. Price 20.00GBP. Go HERE. This is a Taranis main battle tank with an energy weapon turret featuring a small cabin for a crewman. It is composed of five resin pieces which are the upper hull, the lower hull, right and left propulsion fins sections and the energy weapon turret. You can see them here with a scale of 1cm squares under laying the pieces. It is easy to assemble and we supply the kit with the finely detailed anti-gravity left and right fins on supporting resin blocks which can be removed with a hobby blade. 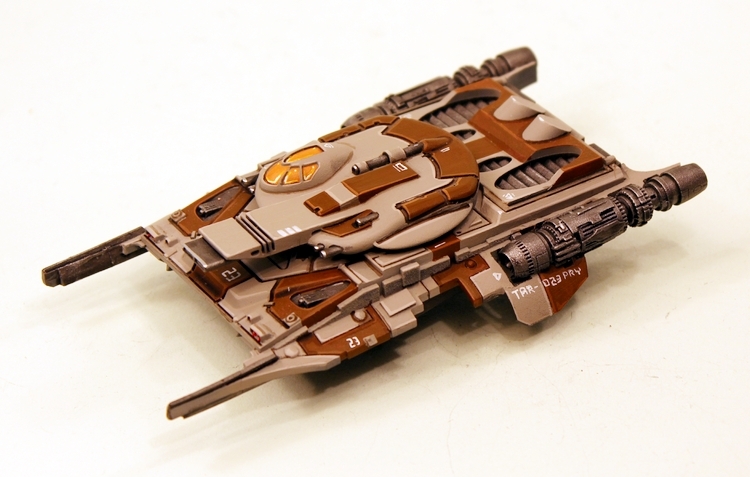 This vehicle is designed to be used for wargaming and thus it is durable. Assembled this vehicle is just over 110mm long and 55mm wide. We offer the choice of purchasing one kit or on the drop down menu the purchase of three with a saving of 10% on screen. Price 20.00GBP. Go HERE. 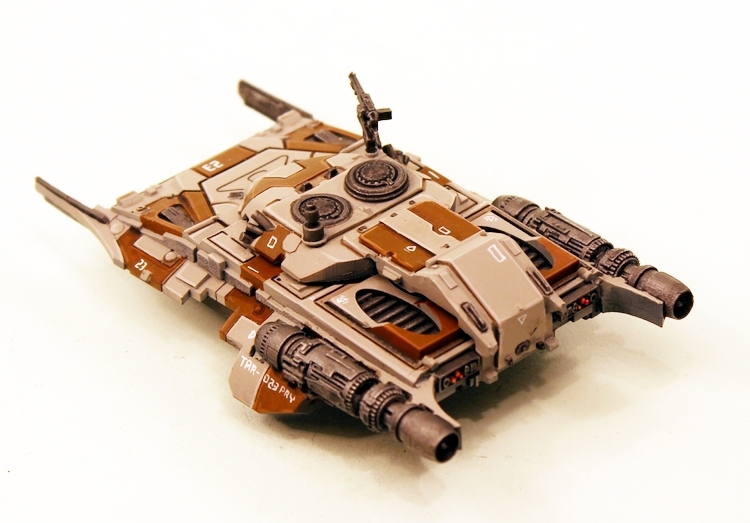 This is a Taranis main battle tank with a double weapon turret for close in destruction. It is composed of six resin and white metal pieces which are the upper hull, the lower hull, right and left propulsion fins sections, white metal sponson gun and the double cannon weapon turret. You can see them here with a scale of 1cm squares under laying the pieces. It is easy to assemble and we supply the kit with the finely detailed anti-gravity left and right fins on supporting resin blocks which can be removed with a hobby blade. 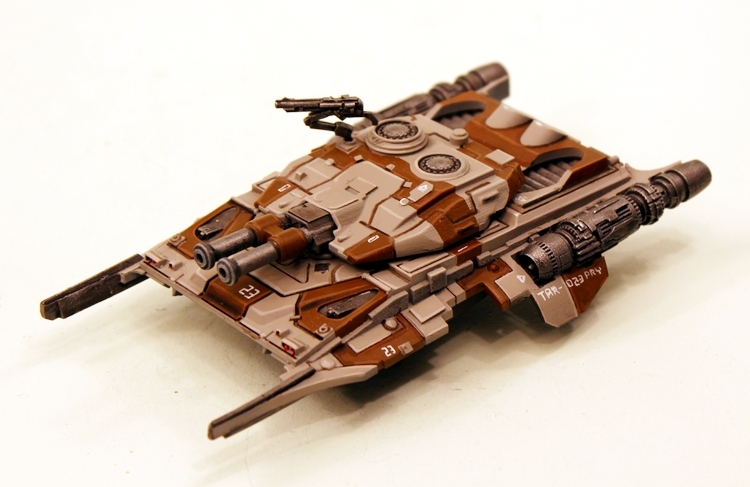 This vehicle is designed to be used for wargaming and thus it is durable. Assembled this vehicle is just over 110mm long and 55mm wide. We offer the choice of purchasing one kit or on the drop down menu the purchase of three with a saving of 10% on screen. Price 20.00GBP. Go HERE. This is a Taranis tank with a re-purposed function as a super heavy Armoured Personnel Carrier capable of carrying a squad or more into battle. It is composed of five resin pieces which are the upper APC hull, the lower hull, right and left propulsion fins sections and the white metal sponson gun. You can see them here with a scale of 1cm squares under laying the pieces. It is easy to assemble and we supply the kit with the finely detailed anti-gravity left and right fins on supporting resin blocks which can be removed with a hobby blade. This vehicle is designed to be used for wargaming and thus it is durable. Assembled this vehicle is just over 110mm long and 55mm wide. We offer the choice of purchasing one kit or on the drop down menu the purchase of three with a saving of 10% on screen. Price 20.00GBP. Go HERE. 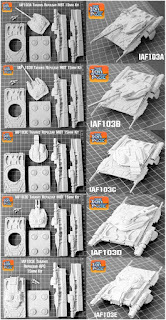 Here are pictures of all the IAF103 parts as single items with under laying scale in 1cm squares for you to look at. There are several articles on our blog that tell you and show you much more about IAF103 and IAF082 that we could possibly fit here or on our website. Click on the links that interest you and see every tank painted, in action, scale shots, unassembled kits and dimensions, concept art, fiction. To see all the posts click on this link which takes you to the Taranis 'tab' on the blog HERE. IAF082 Taranis Repulsar Drones now released! Taranis Tanks make use of a screen of Drones acting as a defensive, offensive, repair group controlled by the tank itself. These are shown on table as IAF081 Taranis Running Drones which can be seen and also the now released IAF082 Taranis Repulsar Drones which can be seen HERE. Both are on our website as a pack and as singles. If you would like to read more about the Taranis Drones in the fictional setting of The Ion Age please visit this INFORMATION BURST article. We have other releases this month and these are the whole Prang Raiders force plus a platoon pack and the latest pack of characters from Dave Foley too. If you missed out on the ESO offers on the Taranis now is your chance and you get your Reward Points on your account with us and of course the monthly free miniature in your package currently IMP29 Planetary Militia Cold Climes Sergeant. Prang Raider packs and platoon now released!